This months seems to be reminding me that my little babies are all growing too fast. Tate finished kindergarten. Evangeline grows more independent every day. And Scarlett seems to be understanding and fighting her diagnosis every day. Scarlett’s latest appointment was this past Thursday. It was another lumbar puncture appointment. In months past, we have dreaded these mornings simply for the fact that she cannot eat. We decided the past few times to prepare her the night before. She typically cries and protests and tells us what she wishes she could eat. This whole process is pure torture for our breakfast girl. This month, I told her before bed that she couldn’t eat in the morning. She simply said “ok. Can I pack a snack?” That went a lot easier than I expected! Even the next morning, she asked if we could snuggle while Tate and Evangeline ate breakfast. She picked out some snacks and packed her backpack. Scarlett had been having problems with her port recently. In April, when we needed blood for a culture, we couldn’t get a blood return. Last month seemed fine. This month, her port was clotted. She had to have a dose of alteplase (TPA) which is like a really strong clot buster. She has had it once before when her PICC clotted but this is the first time with her port. Dr. H told Brock that, as we reach the life expectancy of her port, this becomes common. If I remember correctly, a port is typically replaced after about two years. Scarlett’s will be two years old in September. Ports come in different sizes and kids grow quickly. That port has done a lot of work in these past two years! When it came time for the lumbar puncture, she seemed to have a harder time. She is getting bigger and seems to be more aware of what is going on. Or she’s just requiring more medication now. After she was given the Versed and morphine, the doctor began the procedure. Scarlett started crying because she could feel the needle. She was given a little more morphine and did fine for the rest of the procedure. She recovered fine and was soon eating her snack. Another day done! I have noticed the past few months that as I give Scarlett her oral meds at night, she is fighting me more and more. What used to be an easy process – stick the syringe in her mouth, shoot slowly and she’d swallow without waking up and barely moving – has become more difficult. She now literally fight me sometimes. I have to hold her arms to prevent being slapped and she wakes up, giving me a dirty look. 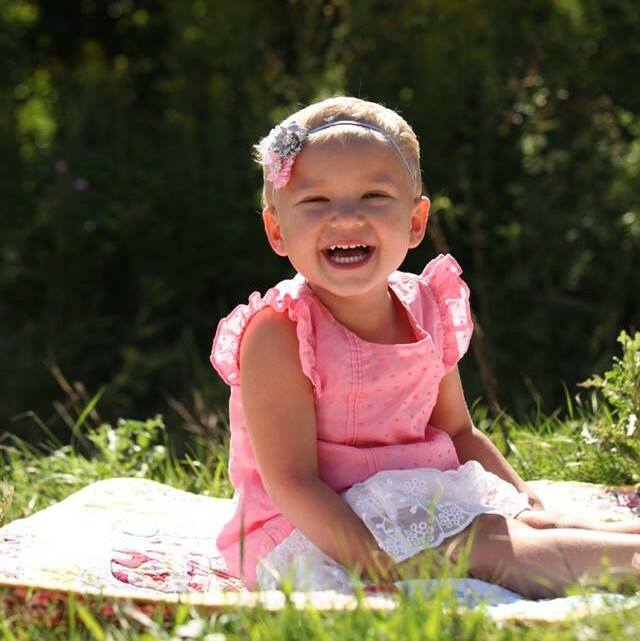 Scarlett has also been diagnosing her dolls and stuffed animals with cancer. She informed me this week that her kitty had an appointment and Kitty was scared. She was “getting her flu shot and she has cancer too”. She puts a little emphasis on the cancer – stretching out the A to show that’s it’s really important. I’m not sure what the reasoning behind this development is. Does she understand that not everyone has cancer? Is she looking for a partner to share her cancer with? Or is it simply a phrase that she knows too well? The following day we were asked to contribute to a news story being done about Cole’s Cancer Crusade. The Stoffel family has done so much for us that we wouldn’t have missed out on an opportunity to help them! We were a little (a lot!) nervous about Scarlett’s mood that day. Her reaction to the steroids has been varying greatly the past few months. Last month, she slept for most of the day after her appointment. The month before, she was so crabby! We really lucked out with a happy, adorable little one this month! Any chance to see Cole, she was excited about! She was a little shy at first but quickly warmed up to Alexa. Before long, she was running around the gym, chasing Nathan, and racing with all the kids. She was very excited to wake up the next morning and see herself on TV! Later this month, Evangeline and Scarlett will celebrate their fourth birthday. They have been busy helping me plan their birthday party and giving me direction on what they want to wear, what color cake they want, who should be invited…I think my party planning days are over. I’m not prepared for them to grow another year older but I am so grateful that they both are. We are thankful for every day!